In this tutorial we discuss breaking away from basic lighting techniques and thinking more about using creative lighting to allow the subject to stand out from the background. We will post several short tutorials where we use specific photographic examples to discuss technique and the differences between the photos while describing lighting techniques. One of the first items that everyone buys as they become serious about underwater photography is an external strobe. In many cases, photographers jump straight into the idea “if one strobe is good, then two is even better”! Although I would never tell anyone not to purchase a second strobe, having two strobes is not the be all and end all of underwater photography. Of course having two strobes is great for all manner of photography and having two is always best in case there is a problem with one. However, one thing always holds true in photography: it’s not the amount of light, it’s the quality of light that makes the image. In underwater photography, one of the keys to improving your macro photography is to consider the mantra “less is more”. One of the ideas that we teach to our students at the Bali Academy of Underwater Photography is that there are basically two types of lighting: front lighting and creative lighting. (obviously this is just a general breakdown, many forms of lighting exist) Front lighting is the easiest kind of lighting to understand as it requires either using one strobe from directly above the housing or two strobes from either side. However, once novices learn how easy it is to use this type of lighting many of them don’t go beyond it. In the two accompanying photographs, the first was taken using front or flat lighting and the bottom photo was taken with what we call creative lighting. Neither photo has been touched up with post processing, other than to remove a few specks of backscatter, in order to illustrate the point. Each photo was taken with a 60mm lens with settings of f22, 1/250 and ISO 200, the only difference between the two photos is the lighting. The “flat lighting” photo was taken with two strobes, one to either side of the camera with the right strobe set to a slightly lower power. The second photo was taken with one strobe, from the left, and with my fingers held across the front of the strobe. To get a similar look to the bottom photo a snoot could also be used but that is a subject for another day. Both of these photos are exposed correctly, however, there is a lot of difference between the two. The key difference being how the subject (the crab and anemone) stands out from the background. The flat lighting in the first photograph is great for identification photographs but I feel it lacks in artistic merit as the brightly lit sand distracts from the colours of the main subjects. 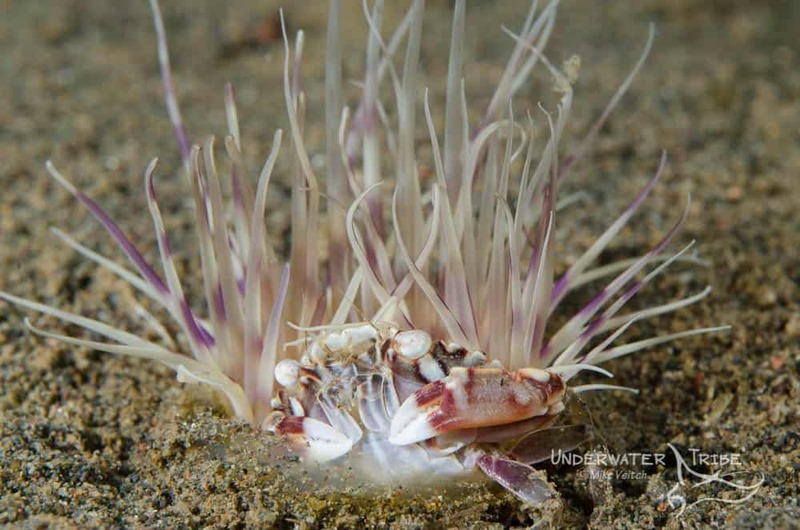 The bottom photo on the other hand directs the viewers eye toward the crab and anemone and does not illuminate the sand. One of the key things to think about when learning to take photographs underwater is not just making sure you get the correct exposure every time, but learning to see which areas of the frame need illumination more than others. We will discuss “Lighting Matters” again in a forth coming photo tutorial, stay tuned for more. 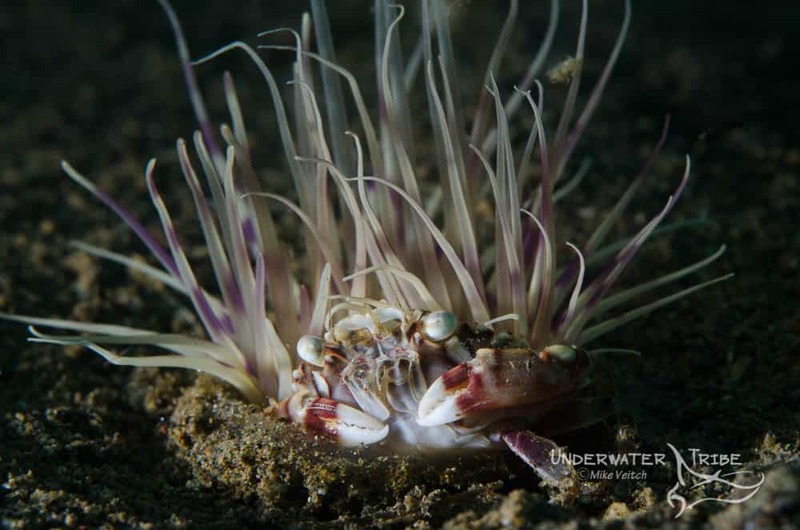 To see more of our past tutorials please visit our Underwater Photography Tutorials page.